Ann Dusenberry played Lucy's daughter, Margo Barker McGibbon in the ill-fated Life With Lucy series in 1986. The character of Margo was married to Curtis McGibbon's son Ted (played by Larry Anderson), a law student. Ann, born in Tucson, Arizona, has spent virtually her entire career on television. She began receiving roles of substance in the late 1970s in such TV-movie projects as The Possessed (1977). 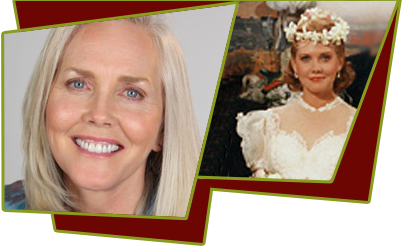 In 1978, Ann was cast as Amy March in the TV-movie version of Little Women, which eventually became a weekly offering. Ann Dusenberry's series-TV roles include the roles of Molly Nicholas Tanner on The Family Tree (1983). Dusenberry studied theater arts for four years, first at the University of Arizona, then Occidental College. She got her first role by circulating her resume and photograph within the Universal Studios offices using internal envelopes obtained by her boyfriend, a truck driver for Universal. She signed a seven year contract with Universal. Following are some of the shows Ann Dusenberry has performed; Play Nice (1992) as Pam Crichmore, Rich Girl (1991) (voice) as Additional Voices, Men's Club, The (1986) as Page, Long Time Gone (1986) (TV) as Marilyn, Basic Training (1985) as Melinda, He's Not Your Son (1984) (TV) as Holly Barnes, Lies (1983) as Robyn Wallace, National Lampoon Goes to the Movies (1983) as Dominique Corsaire ('Success Wanters'), Close Ties (1983) (TV) as Connie, Confessions of a Married Man (1983) (TV) as Jennifer, 'Family Tree, The' (1983) TV Series as Molly, Killjoy (1981) (TV) as Joy Morgan/Elaine Steel, Cutter's Way (1981) as Valerie Duran, Elvis and the Beauty Queen (1981) (TV) as Jeannie, Heart Beat (1980) as Stevie, Secret War of Jackie's Girls, The (1980) (TV) as Donna, 'Little Women' (1979) TV Series as Amy March Laurence, Goodbye, Franklin High (1978), Desperate Women (1978) (TV) as Joanna Dance, Little Women (1978) (TV) as Amy March, Jaws 2 (1978) as Tina Wilcox, Possessed, The (1977) (TV) as Weezie Sumner, Stonestreet: Who Killed the Centerfold Model? (1977) (TV) as Amory Osborn alias Angel Collins, 'Captains and the Kings' (1976) (mini) TV Series as Ann-Marie Armagh, and White Line Fever (1975) as Waitress in truck stop diner. She is married to composer Brad Fiedel, whom she lives with in Santa Barbara, California. They have two daughters. She received an MA degree in Marriage and Family Therapy, and works as Artistic Director of the Actors’ Conservatory Theatre in Santa Barbara, California.